Have you seen the web push notifications on popular websites like Facebook, Pinterest, etc.? 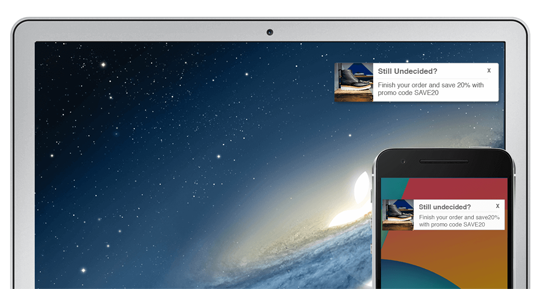 Web push notifications are becoming widely popular because they provided a better way of reaching your subscribers. 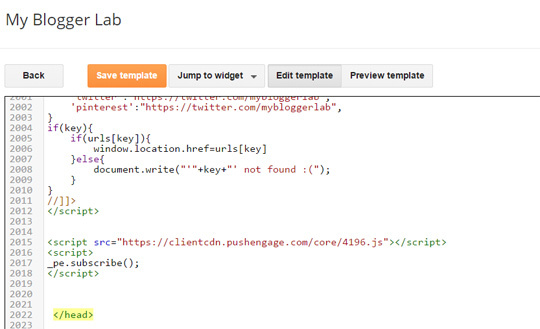 Recently, one of our users asked us about how to add web push notification in Blogger. And the answer is yes, why not. 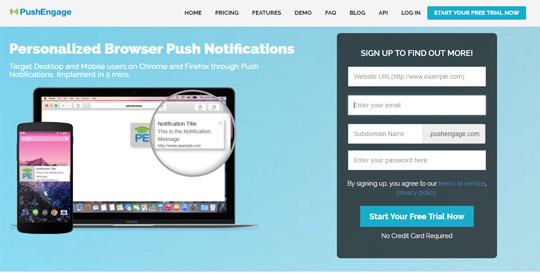 Today in this article, we will show you how to add web push notification in your Blogger Blog. 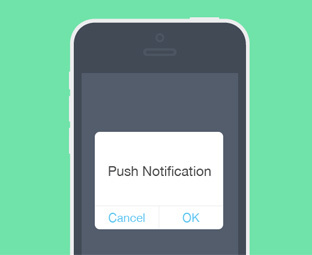 Web push notifications are small messages that come from an app or a website. These messages are clickable and appears on your desktop, even if you're not using the app or website. Popular sites like Twitter, Facebook, Pinterest and more are already using web push notifications. And they are claiming it to be more engaging then email marketing and social networks. It will engage more users on your blogger site and would significantly increase the total page views and the number of returning users. They also provide both FREE and Paid packages depending upon the number of subscribers you have. You can start with FREE package and can upgrade to a paid one based on your needs. The very first thing you need to do is to go to PushEngage Signup Page and register a free account. With a free account you can send notifications to up to 2500 Subscribers. To register, enter your website URL, Email address, Sub domain and your password. After entering all information, press "Start Your Free trial" button. After registering a Free account on PushEngage, you will be then redirected to the Installation setting page. In the installation settings, you have to enter your Site Title, Site URL and Site Logo. After entering all relevant information, press "Update Site setting" button. Congratulations, you have successfully added web push notifications in your Blogger blog. Now when you'll visit your blog you will see a notification asking you to Subscribe to the Push notifications. 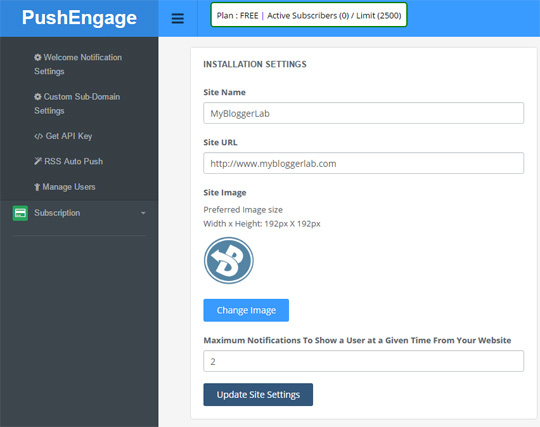 On PushEngage Dashboard, go to Subscription Dialog Settings. From Dialog Type you can select from 4 different styles. But the most attract design is "Safari Style Box". You can also see the preview of the subscription dialog box on the right. After selecting a design press "Update optin Settings". Go to PushEngage Dashboard >> Notifications >> New Notification and fill all the necessary details like notification title, notification message and notification URL. Once everything is done press "Submit" button and your notification will be created and sent to your all subscribers. We hope this tutorial has helped you in Learning how to add web push notifications in blogger. If you know a better and Free web push notification service feel free to leave its review in the comments below.